* Teams, coaches, officials, please show up early for games and be ready to play as the city would love to allow the public full access to the pool as early as possible. Games COULF begin at a slightly earlier time throughout the day. At 1 pm the pool opens to the public for swimming in the shallow end and baby pool. Play nice with others. Secure valuables. Hot and humid weather is expected. The city wants water polo games to wrap up by 3:30 pm or sooner so that the pool patrons can use the entire facility. Closing part of the pool for water polo games has never been done before. Game times are going to start on or before the scheduled times. Team are asked to be prepared in advance of the published game time. It would be great if the teams and officials are ready and the first game could begin earlier. Only the deep end of the pool being guarded, so players should not warm-up in the shallow end. Bring a lawn chair. Tents can be deployed away from the pool in the grass area, not pool side. Spectators are free. Swimmers pay the daily rate. Spectators that swim, pay the daily rate. Spectators and non-athletes are going to get a wrist band, no charge, at the pool at the gate. The wrist band can help for re-entry to the facility as patrons pay to swim or else have tags. There is ample parking on the street throughout the park and in a lot near the volleyball courts. Help with set-up, tear down and overall upkeep of the grounds is most welcome. Pop up, mini-clinics for youngsters and fans are expected throughout the day’s activities and experts, including a Renegade players too, can help in small group settings by explaining the game’s rules and sharing insights with visitors and first time fans — to better promote water polo. 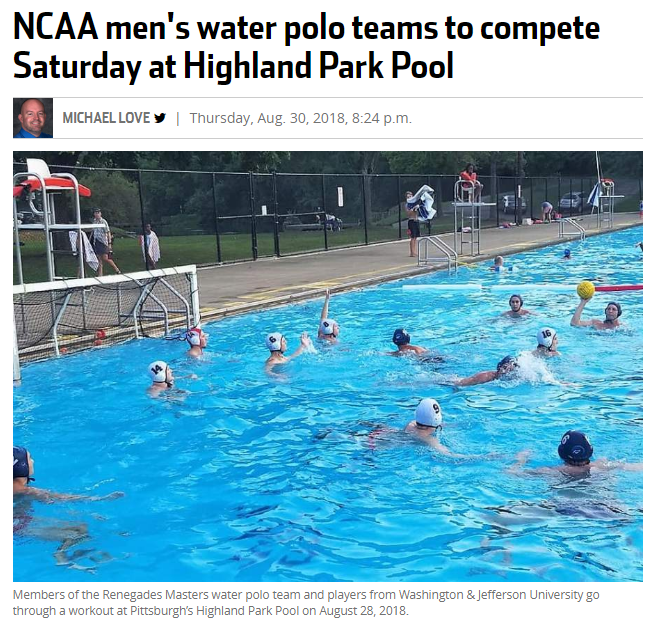 Four NCAA Men’s Varsity Teams to play water polo at Pittsburgh’s Citiparks’ Highland Park Pool on Saturday, September 1, 2018. This week is the final week of summer practices, 6 pm to 7:45, at Citiparks Ammon on 2217 Bedford Ave., Pittsburgh’s Hill District. Hope to see you there Tuesday, Aug 14, and Thursday, Aug 16. Next week, practice shifts to the Northside and Citiparks Sue Murray Swim Pool on Cedar Ave. The pool there is smaller, but we can still have some deep water to practice. Same dates and times. 6 pm to 7:45 pm on Tuesday, Aug 21 and Thursday, Aug 23. The following week, when most kids have already started school, we’ll shift practices again, to Citiparks Highland Park Pool, the site of the Sept 1, 2018, game day with NCAA Teams. Highland Park Pool is behind the Pittsburgh Zoo and Aquarium on Lake Road. Practices at Highland Park are still 6 to 7:45 pm on Tuesday, August 28 and Thursday, August 30. The next six outdoor practices are all outdoors, so weather permitting, of course. 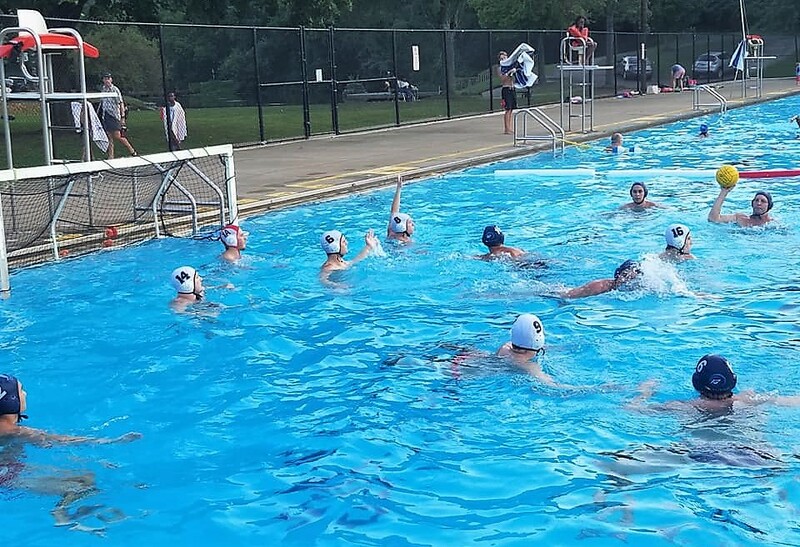 The best opportunities for full pool scrimmages are this week, August 14 and 16. Help is needed yanking goals and placing them at the various pools in the weeks to come. Those with bigger trucks and trailers, please ping Mark Rauterkus, 412-298-3432. That is generally a sticking point. South Park High School is where practices happen twice a week for school-age players. 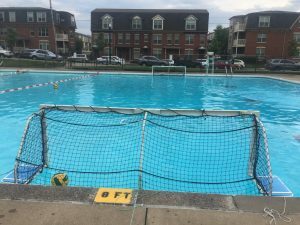 The Pittsburgh Combined program is for scholastic water polo players from any school district in grades 12 to 6 — and it is being operated this season through the efforts of the South Park Aquatic Club and Coach Christian with the help of both Coach Mark Rauterkus and Joie Marhefka. We’ve been recruiting competitive swimmers, but have more slots on the team to fill. This week we practice on Monday, and Wednesday, August 13 and 15, 7:30 am to 10 am at indoors South Park High School pool. If you want to join us as we prepare that team for action this fall, we hope, then it is not too much of a pain to get your volunteer clearances and get signed up as an assistant coach. Labor Day Weekend, Saturday September 1, and Sunday, September 2, Renegades have games and the squad line-up of players is still INCOMPLETE. We are going to take 20 players, MAX, and then shut down the line-up. You must be a paid member to pay. And, there are going to be game fees too. SIGN UP HERE at this page on Mark’s site. New Technology. Two games expected on Sunday, Sept 2, at W&J College, indoors, 60 S Lincoln St, Washington, PA 15301. The aim is to make Saturday, Sept 1, a WATER POLO FESTIVAL. This is the first time we’re able to play NCAA water polo games at an outdoor pool in a Citiparks facility. Many of the teams in the region want to attend, but this year we’ll only have W&J, PSU, Mercyhurst and Gannon. Perhaps we make next years a multi-day tournament and include more teams. 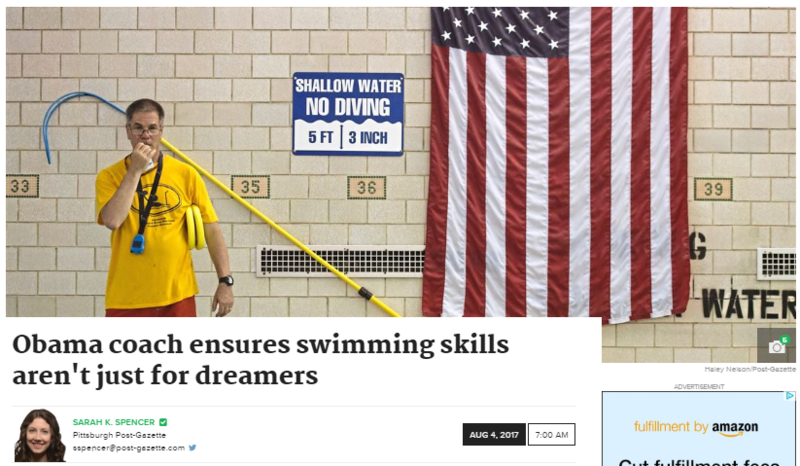 Perhaps we run a camp for high school players the prior week and even include SKWIM in the shallow part of the pool. Help with the PR for the Sept 1 Game Day with NCAA Teams. We should use social media to spread the word of the games to various sites, groups and to our contacts. Anyone want to help with that? Email Mark@Rauterkus.com. On Monday, Coach Mark is going to a summer camp with 100 kids and inviting the youngsters and their families to attend as spectators. If anyone wanted to pay a little bit of $ to boost that URL and promote the event, feel free to do so. CLINIC leadership for the September 1 event. We’d like to have EXPERTS lead on-going clinics for those interested in learning more about water polo while at the event on September 1. To sign up to lead part of the clinic, go to this page. Poll: Would you attend Thursday night practices at Chartiers Valley H.S. Pool? Take this poll. If we don’t get 10 or more people to sign up, then we know we should not rent the facilities. Got to figure out the demand. Other options are still in the works, but let’s test the waters with this time, dates and location and see what everyone things. Leave a comment on that page if you wish. First, we had another big practice with great weather and deep water at Citiparks Ammon outdoor pool. Notice the SKWIM lagoon boarder that splits the water polo course from the rest of the pool. Attached to the PPG Paints Arena! 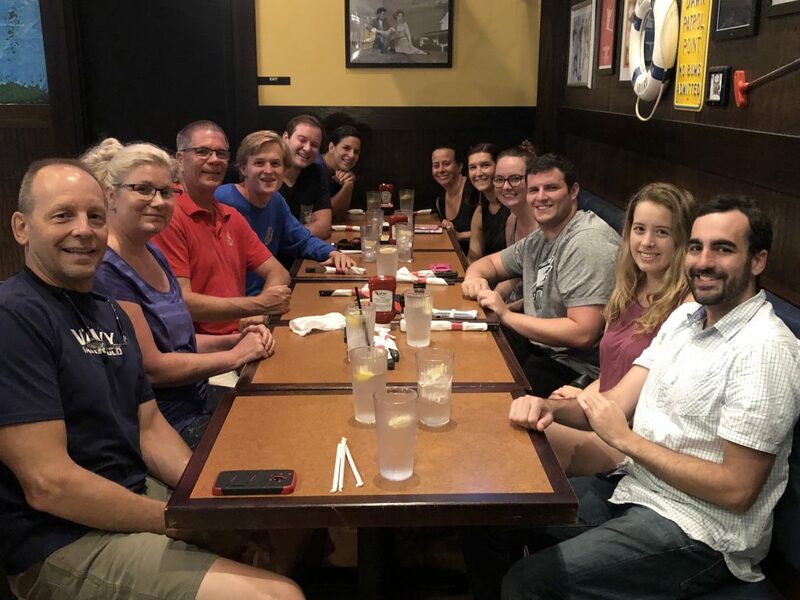 Squad fixes its hunger and thirst with companionship among old and new friends. Adrienne Fyock and Wilbert Kragten at the North Park Triathlon. Summary from the Quarry: 3 great games. Lost in sudden death to the same team that beat us by 4 in the previous game! We are currently looking for a pool for the fall. If you have a connection or know of one that might be “centrally” located then please send me an email! Chartiers Valley in Bridgeville has reached out looking to start a high school program at the school. Please email: aquatics@cvsd.net if you or anyone you know of might be interested. Very exciting times! Labor Day Tournament is approaching! We need to know if you plan on attending. Please always send updates, pictures, questions, and comments our way! With so many new members i am going to LOOK INTO ordering more shirts as a few people have asked. I cannot quote the exact price as these are now additions to an old order. I asked about black hoodies with the same logo and pricing would be anywhere from $25-$35 depending upon the number ordered. If we want to order team suits we need a minimum of 6 from Kap7. Please respond with what you would want to order if we did place one: short sleeve shirt, long sleeve shirt, hoodie, suit (sizing can be found on kap7 for suits). Any other suggestions of attire or gear then send my way and i can shop around for pricing. 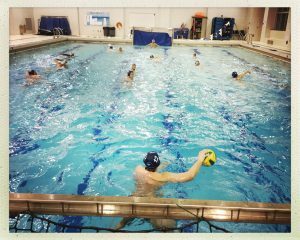 Regular Water Polo Practices continue on Tuesdays and Thursdays. 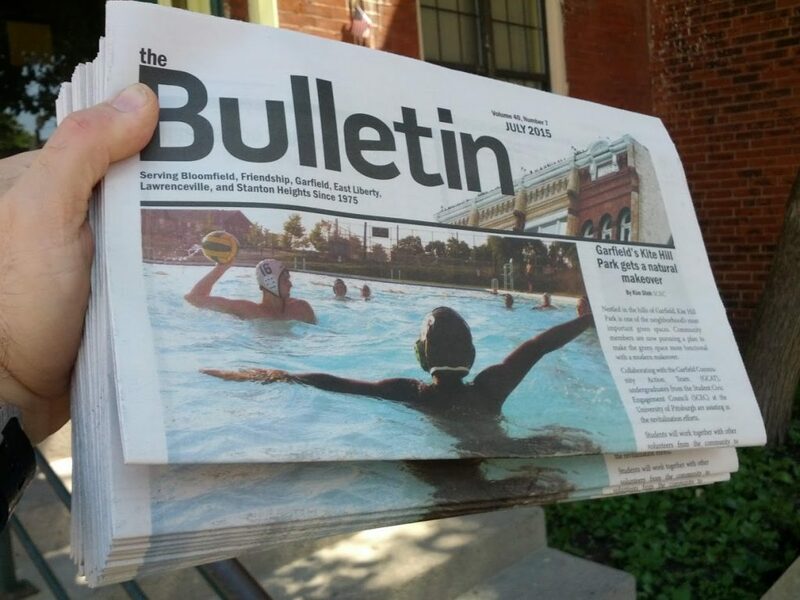 We’ve got four more water polo practices at Ammon outdoor pool, weather permitting. 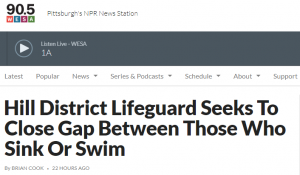 Then Ammon pool closes and the city only keeps a few pools open due to lifeguards going back to college, and students to school. So we’ll go to Northside’s Sue Murray outdoor pool for one week, 2 practices. Then leading up to our Labor Day Weekend games on September 1 and 2, we’ll shift practices to Highland Park Pool. All of the practice schedule details and links to locations are in a Google calendar that is linked to off of CLOH.org. Anyone can subscribe to the Google Calendar and then copy dates easily to your own personal calendar. Reminders and such are then to your own desire. The Google CLOH.org calendar has all of the events Coach Mark organizes. So if you are not interested in Underwater Hockey, ignore it. An Underwater Hockey clinic is slated for 6 pm to 7:45 on Friday, August 10, at Ammon. The Thursday social is going to be at the TGI Fridays at PPG Arena. We had a request for a Downtown location. No events at PPG Arena, where the Penguins play, so the place will have plenty of nearby parking. A total of 14 events are being hosted at Ammon pool in the next two weeks, with four of them being the Renegades water polo practices. From 3:30 to 5;30 on most week days a water safety and SKWIM clinic is being conducted. Details at a new site, https://Ammon.4rs.org. Sign up for the matches on September 1 and 2 with https://Renegades.4rs.org site. Pittsburgh Combined Water Polo, the team for students in both high school and middle school from any school district (except NA, of course) is holding practices at South Park High School on Mondays and Wednesdays from 7:30 to 9 AM until school starts then the practices shift to 7:30 to 9 PM. This new venture is looking for athletes. Do you know anyone? Pass the word. Coach Mark or Coach Christian can follow up. Kids from Pittsburgh, South Park, Mt. Lebo and Elizabeth Forward have been attending. More are expected from BP and Peters, at the least. In the fall, we’ll resume the Saturday Swim School at Oliver High School on Brighton Road in the Northside. Another hope is to host practices on Thursday evenings at Pittsburgh Public Schools Perry High also on the Northside. Think about PR for the Saturday, September 1 event at Highland Park Pool. We need a poster. Any artists? Would be good to hit coffer shops and try to get an audience for the gamest that day. Think about leading part of a clinic for the fans and spectators, and perhaps youngsters, for the September 1 event at Highland Park Pool. Can you talk for 15 minutes and share some water polo insights as an expert? Going to ask the college coaches to do some of this, but we have experts with Renegades too. Sign up here. 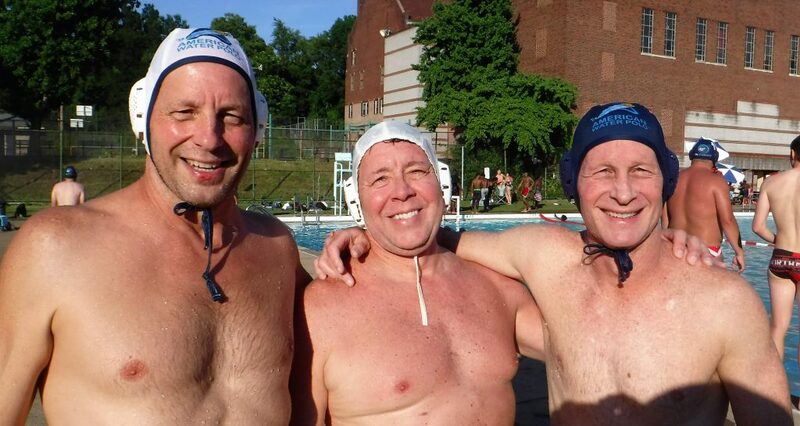 Michael, Greg senior and Greg junior after the first day of action in the open water water polo event in Ohio.